The newly created qualified opportunity zone (QOZ) development program has created a lot of buzz – and many questions – among investors, real estate developers and business owners. The program, created to help spur economic activity by investment in low-income neighborhoods in exchange for deferred capital gains, creates qualified opportunity funds (QOFs), which are partnerships or corporations formed specifically to invest in QOZs. Investors, who benefit the most by making investments before the end of 2019, have been waiting for clarifications before they could proceed. The IRS is allowing taxpayers to act on the proposed regulations, as long as certain conditions are met. In issuing proposed regulations on Oct. 19, 2018, the IRS addresses some of the fundamental questions regarding the initial investment in the funds, and how the funds should be created. It also provided guidelines regarding the definition of a qualified opportunity zone business (QOZB), the treatment of debt in a QOF and the substantial presence test, among others. QOZBs may retain cash, cash items and certain debt as reasonable working capital for up to 31 months without causing a failure of the 90 percent asset test if certain conditions are satisfied. Only capital gains will be eligible for deferral. In the case of a partnership, a partner may defer its share of qualifying capital gains of the partnership by reinvesting the gains in a QOF. A pre-existing entity may self-certify as a QOF using Form 8996, as long as it satisfies a requirement that it does not own a significant amount of tangible property that it acquired prior to Dec. 31, 2017 (Section 1400Z-2(d)); the regulations also include the process for self-certification. For purposes of the requirement that “substantially all” of a partnership’s or corporation’s property owned or leased must be qualified opportunity zone business property (QOZBP), “substantially all” means 70 percent. A QOF can be an LLC taxed as a partnership or corporation. Investment in a QOF must be an equity interest; debt does not qualify. Taxpayers who are owners of an eligible interest in a QOF (an interest to which the tax benefits apply) may use that interest as collateral for a loan. Taxpayers are allowed to reinvest previously invested deferred gains. The ability to make an election to increase basis to fair market value on the sale of a QOF interest is not impaired by the expiration of the designation of the zone at the end of 2028. In a related revenue ruling affecting the substantial improvement test, the Department of Treasury clarified the “double-down” provision requiring an investor to make improvements equal to the value of the property. Now the investor is only required to make improvements based on the value of the building. The proposed regulations also define a QOZBP and a QOZB, both of which we will cover in upcoming blogs. There remain a number of outstanding questions that the IRS and Department of Treasury are expected to address before the end of the year, such as the application of the penalty to QOFs, a more detailed definition of QOZBP, whether a QOF can invest in more than one OZP or business and/or OZP or business in different QOZs, and the tax consequences of the sale of an asset by a QOF (or a subsidiary of a QOF) and the exit of investors from a fund. In the meantime, the IRS has issued an updated Q&A on the QOZ program. Watch for upcoming blogs from Skoda Minotti as we take a closer look at the benefits of QOFs to investors and real estate developers, and a number of other topics. For immediate questions, please contact Chris Sivak at 330-668-1100. 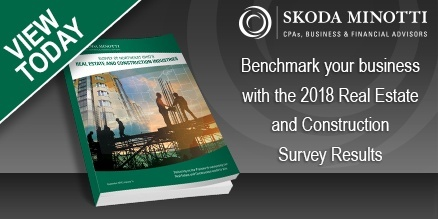 This entry was posted in CPA & Business Advisory, Real Estate/Construction Accounting and tagged business owners, cpa & business advisory, investors, IRS, Opportunity Zones, real estate and construction, real estate developers, regulations. Bookmark the permalink. Follow any comments here with the RSS feed for this post. Comments are closed, but you can leave a trackback: Trackback URL.